Professional floor cleaning company offering wide range of floor cleaning, polishing and restoration services, available for residential and commercial properties in London and Greater London. four profiles were found for Cleaning-floor.co.uk in social networks. Among other social networks the website is represented in Facebook, Twitter, GooglePlus and Pinterest. The web server with the IP-address 77.104.131.93 used by Cleaning-floor.co.uk is run by GetClouder EOOD and is located in Bulgaria. 10 other websites are located on this web server. Most of them are provided in the english language. 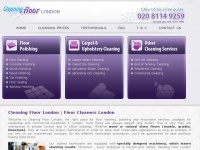 The websites of Cleaning-floor.co.uk are hosted by a Nginx server and were developed in the programming language PHP. The HTML pages were created with the latest standard HTML 5. The visitor analysis software Google Analytics is used to analyze the visitors of the websites. Both the inclusion of the website in search engines and follwoing of its hyperlinks is explicitly allowed.